Showtech Australia is one of a growing number of companies investing in and using Kinesys automation products regularly in both their day-to-day and custom work. The company was founded in 1987 by Tiny Good with headquarters in Braeside, Victoria, and a satellite office in Hong Kong – to serve the growing Asian market. As a busy production facility, it reached a stage where owning a reliable and flexible brand which could be used as standard for all projects made sense … and the first purchase was the Kinesys Velocity drives, Vector control and a Mentor E-stop interface, which they used in combination with their existing Zero Fleet AC winches. Other subsequent Kinesys investments have included LibraCELLs, more Velocity Drives, DigiHoist , mini Array PDES, Vector console, Liftket 1 tonne motors and Elevation 1+ drives … “and there will be more coming” confirms Tiny. Tiny reckons the DigiHoist is “one of the best and most powerful fixed speed controllers on the market and great value for money” with features like digital communications, limit monitoring, load and position feedback and group halt functionality. Vector is “a great piece of control software that’s powerful, user-friendly and straightforward to teach people in terms of operating a basic show, as well as being extremely stable and reliable”. 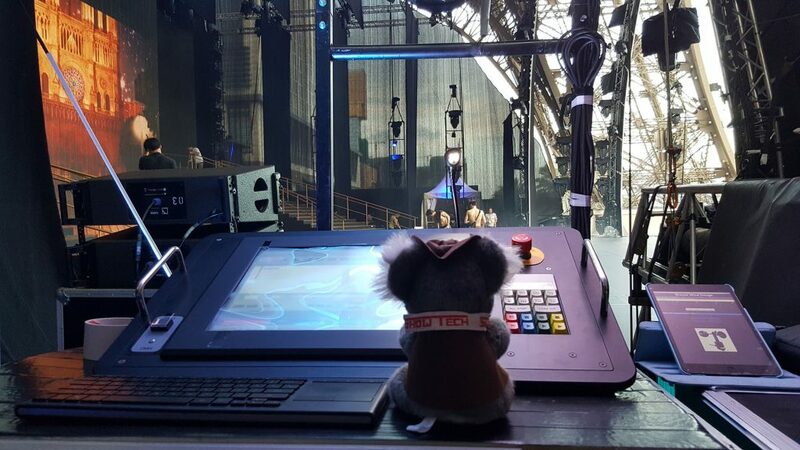 Showtech has proudly been engaged and worked with many producers within Australia and internationally to produce both complex and simple motion and aerial scenarios for shows and events with their Vector system. Along with Showtech’s growth of shows requiring automation and motion control comes the need for training new operators and Tiny has taught the system to several key personnel who are now operators in their own right. LibraCELL and DigiHoist are regularly used by Showtech to ensure real-time monitoring of the hoist loads. Tiny believes that LibraCELL and DigiHoist will become increasingly common in the concert, event and touring sectors, especially when video walls are concerned, which is something they are pushing to make mandatory in Australia, especially when involving more than three support hoists. The support they receive from Kinesys is “really great” despite the difficulties of being in an opposite time zone and together with recent expansions at Kinesys USA this has become “even easier”. The evolution of the motion control sector of the industry is a hot discussion topic in the rigging community right now and something that Tiny feels Kinesys addresses in its ongoing and forward thinking product development. Tiny and Showtech are looking forward to the ongoing expansion of their Kinesys inventory and the exciting future of automation and motion control.